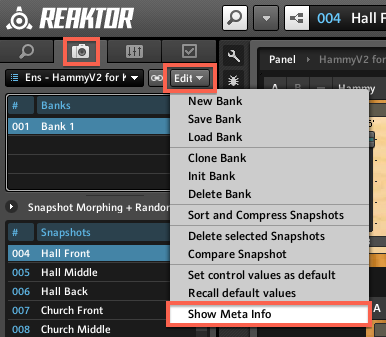 This article will guide you through the required steps to add a REAKTOR 5 Ensemble to the KOMPLETE KONTROL Browser. You will also learn how to optimize your Ensemble for display within KOMPLETE KONTROL. The following instructions apply to both User Ensembles and Library Ensembles. We will demonstrate this using the HammyV2 Ensemble available for download in the REAKTOR User Library on our Website. 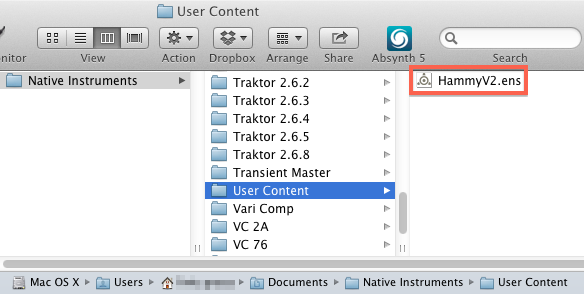 Note: If you want to prepare your User Ensembles with REAKTOR 6 read this article. Important note: KOMPLETE KONTROL requires REAKTOR 5.9.2. If you have not done so already, please install the update now. First of all, name your Ensemble as you want it to appear in the KOMPLETE KONTROL Browser. In this example, we are using the HammyV2 User Ensemble, which we will rename to HammyV2 for KK. Switch to REAKTOR's Edit Mode. 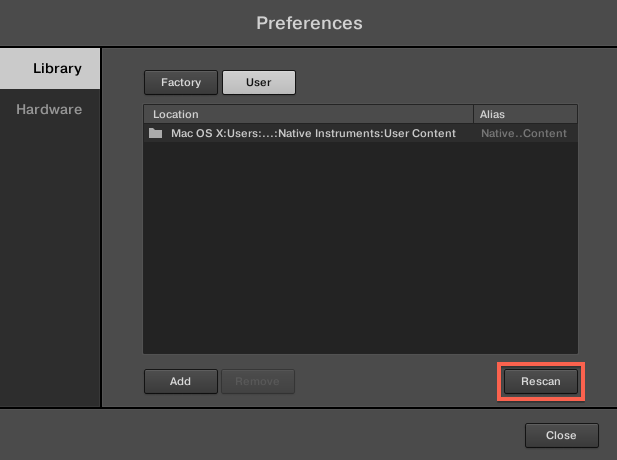 Open REAKTOR's Properties tab and navigate to the FUNCTION tab. Name your Ensemble as you want it to appear in in the KOMPLETE KONTROL Browser. Here we are naming it HammyV2 for KK. Note: KOMPLETE KONTROL will use the name of the Ensemble's Snapshot Master to generate a new Sub-bank in the KOMPLETE KONTROL Browser. 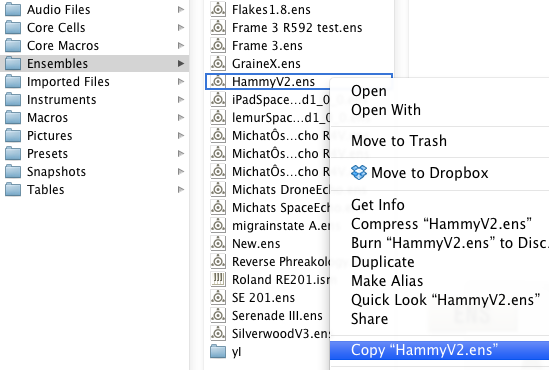 This Sub-Bank will contain all HammyV2 Snapshots (individual sounds). By default, the Snapshot Master is your Ensemble. Once the Sub-bank name is defined (in our example HammyV2 for KK), you need tag your Snapshots as Instruments. Open the Snapshot menu and select your Ensemble for the Snapshot (in this example HammyV2 for KK). From the Edit drop-down menu, select Show Meta Info. Right-click on your Snapshot, and select the relevant tag for your Snapshot next to NI Meta Info. Since the HammyV2 Ensemble is an Instrument, we choose Instrument. 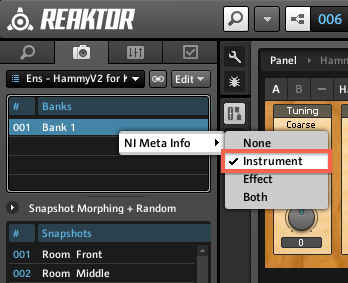 Note: Since effects are not supported in KOMPLETE KONTROL, the REAKTOR Snapshot will not be displayed in KOMPLETE KONTROL's Browser if Effect is selected. 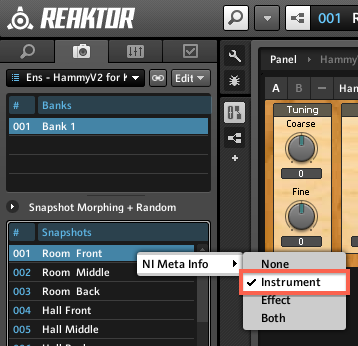 If None is selected, the REAKTOR Snapshot will also not be displayed in KOMPLETE KONTROL's Browser. At this point, save your Ensemble to make the changes permanent. To do so, choose Save Ensemble from REAKTOR's File Menu. For an optimal integration of your REAKTOR User Ensemble to KOMPLETE KONTROL, you can define Default and Additional Plug-in views. These views are based on the Panelsets of your Ensemble. 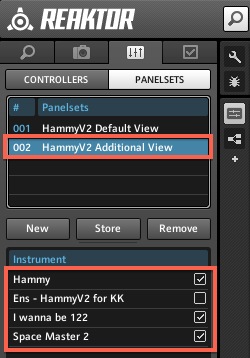 For KOMPLETE KONTROL to recognize a Default and Additional view for your Ensemble, you have to create two Panelsets. Note: If you skip this part of the procedure, KOMPLETE KONTROL will simply take the first Panelset, corresponding to the last saved state of your Ensemble. If you have more than 2 Panelsets defined for your Ensemble, KOMPLETE KONTROL will only recognize the first two. Go to Panel Control > PANELSETS and press the New button to create a Panelset. Select your Panelset and define which elements of your Ensemble should be displayed. Here we define the first Panelset for the Default View in KOMPLETE KONTROL by only selecting the Hammy instrument. Below, we have defined the second Panelset for the Additional View. In this additional Panelset, we have additionally enabled the view of the I wanna be 122 and Space Master 2 effect modules. Once your User Ensemble is optimized for KOMPLETE KONTROL, you can close REAKTOR 5. 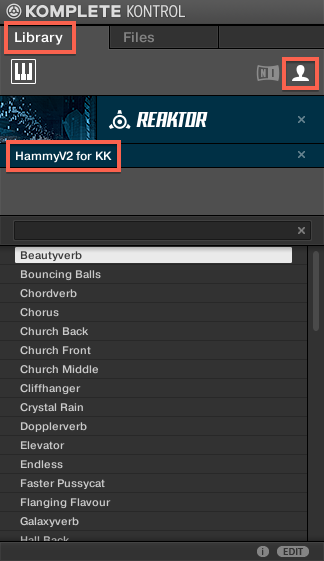 Copy the HammyV2 Ensemble to the KOMPLETE KONTROL User Content folder. 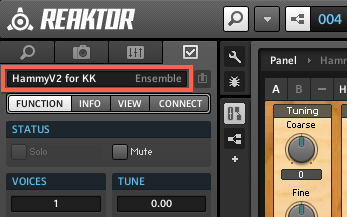 Once the REAKTOR Ensemble is located in the User Content folder, you can Rescan the folder in KOMPLETE KONTROL to add the Ensemble to the database. The content will then be displayed in the Browser. Go to the Preferences and open the User section of the Library Tab. As you can see, the User Content folder is listed here by default. Press the Rescan button in order to update the database with the new content of the folder, which now contains your User Ensemble. Close the Preferences, go to the Library tab of the Browser and click on the little User icon. There, under the REAKTOR Bank, you will see your User Ensemble appear as Sub-Bank, in our example HammyV2 for KK. Below, you will see your User Ensemble's Snapshots. Double-click one of these Snapshots to load it in KOMPLETE KONTROL.